In the days leading up to October 12th, the anniversary of Jordan’s death, I was thrust back into the pain and numbness I felt right after he died. Walking down the hall towards the front door of my house or hearing the phone ring, shifted me back to 2008 and all those traumatic October days. As much as the leaves changing signals fall, it also starts the anniversary days. One thing I knew I needed to do to and I hoped it would make me feel some peace was to visit Jordan’s tree. Jordan’s tree is a crabapple tree that was donated by his sisters’ Girl Scout Troop through a Park District Program. In the summer of 2009, their troop leader called me asking if they had my family’s permission to have a tree planted in Jordan’s memory. My answer was of course an emotional, “Yes.” I was so touched by their offer and also the courtesy and grace they showed by asking how we felt before proceeding with the tree planting. On August 8, 2009 the day before what would have been Jordan’s 20th birthday we had a tree dedication ceremony, which was attended by family and friends. The Girl Scout Troop had a plaque made for us to use at the ceremony because the permanent plaque that would be placed at the base of the tree wasn’t ready yet. The plaque given by the Girl Scout Troop starts with a line from a poem by Margueritte Harmon Bro, “We thank thee for special trees which will always stand large in our memory.” The quote so fittingly expressed the sentiment of the day. 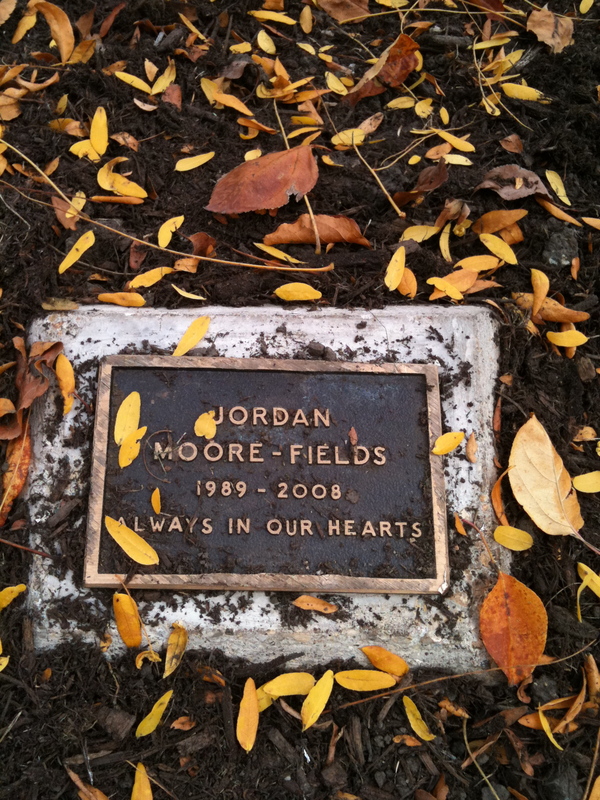 Last week, I went to see Jordan’s tree for the first time this fall. I walked up on his still young tree thinking of Merrick’s words to me the summer before, “I want to tie a piece of the mantle cloth on one of the branches, so when I’m 80 I can come and stand under the tree and look for the cloth.” The spirit of hope and looking towards the future embodied in Merrick’s words made Jordan’s tree even more of a legacy. I came to visit the tree and to see the permanent plaque that was finally in place. The plaque was supposed to be placed at the base of the tree in the months after it was planted. There were problems with the manufacturer, then the weather made installation impossible. When it was finally installed, it was put at the wrong tree. The irony of the Park District’s placement is that they put the plaque at a mature tree that shaded the baseball diamond. Jordan took many practice swings before going up to bat under the shade of that tree. When I first saw the plaque under the “baseball,” tree, I wondered if Jordan was in on the joke. I know he would have found it funny that the plaque started off at the baseball diamond and not near the park bench. The plaque stayed at the “baseball,” tree until this fall because cold weather and frozen ground settled in early last year and prevented it from being moved to its rightful place. Unfortunately the Spring thaw did not quicken the actions of the Park District, despite the efforts of a very determined volunteer in charge of the tree dedications. As fall approached this year, I urgently called the volunteer again alerting her that Jordan’s tree still did not have its rightful marker. When October 12th arrived, I wanted to be able to go and sit near his tree with everything in order. The wonderful volunteer, Mrs. Holmes, must have stood and watched them move the plaque because the day after I called her, she left a voicemail message telling me the plaque was moved. On October 13th, I sat on the bench near Jordan’s tree as its branches framed the children playing in the distance. It is a tree that overlooks the baseball diamond where he played little league baseball and the field and playground where he ran, jumped and climbed as a little boy. It is the perfect place for his tree. I look at his elementary school in the distance and remember my son as a boy getting every bit of use out of his 30 minutes of recess. His clothes were always the proof that he played hard. His pants were worn at the knees and he came home with unexplained rips in his shirts. There is also the infamous day that he called me, needing a whole new set of clothes including socks because he and some of his friends couldn’t resist jumping and splashing in a mud puddle. Jordan’s tree anchors those memories now. As much as fall hurts now with its memories of late night calls and police visits broadcasting loss, it is still a time of beauty. I am amazed that in the shock and numbness of grief, the Technicolor show of nature still beckons me. Even in the days after Jordan died I couldn’t help picking up beautiful leaves as I walked. Two years later I know that the fears I had right after Jordan died, that fall would annually mock me with its brilliance as I stood with my loss are unfounded. The brilliant colors of all the trees still thrill me just as they did before Jordan died. I don’t look away from all the beauty. I stand beneath the trees looking up at the brilliant golden, red and orange leaves with the sun filtering through them. Beauty can coexist with sorrow. The plaque at the base of the tree shows a beginning and ending year for my son’s life. It will never feel right or fair that Jordan’s year of death precedes my own. In the midst of my grief, I’m so grateful that I can sit and look at a living monument, honoring Jordan’s memory. Everyone that walks by can look at Jordan’s tree and hopefully pause and read the plaque, knowing that he is loved, honored and remembered. Jackie… I received your card today. It brought a smile to my face. Your daughter’s girl scout troop represent all that is good and right in this world. Enjoy Jordan’s tree – I see it growing to envelope you and your family with love. As I’ve said before, you write so beautifully. What a lovely post, and a lovely tribute to your wonderful son. I have always thought planting a tree in someone’s memory is the supreme gift. It guarantees that Jordan will live on long after many generations of humans are gone. I’m so happy that you were able to find the peace there, and that the beauty of fall brings you joy. I quickly accepted the invitation to read your post last night. I love your writing! It’s so beautiful, heartfelt and moving. I also knew that I wanted to share this with Nina. So this morning, my not-so-little eleven year old, climbed up in my lap and we read it together. Tears ran down thinking of precious families, loss and now the peace you find in that tree. You are a beautiful woman inside and out! I love the image of the plaque under the tree near the baseball field! I’ll bet Jordan was in on it and he was making sure to make his mark near there for all of the other young boys who come to make their practice swings there. Thank you for this gorgeous reminder to go outside and sit with the autumn trees. 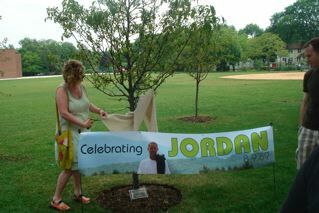 I hope that Jordan’s tree provides shade and comfort for many people as well as your family for years to come. My Neice Michaelle Decola Arnold shared these beautiful thoughts and jester. “LIFE GOES ON” a title to a song our daughter wrote and sang on her CD :”Apple Tree” her music continues to give us new messages. 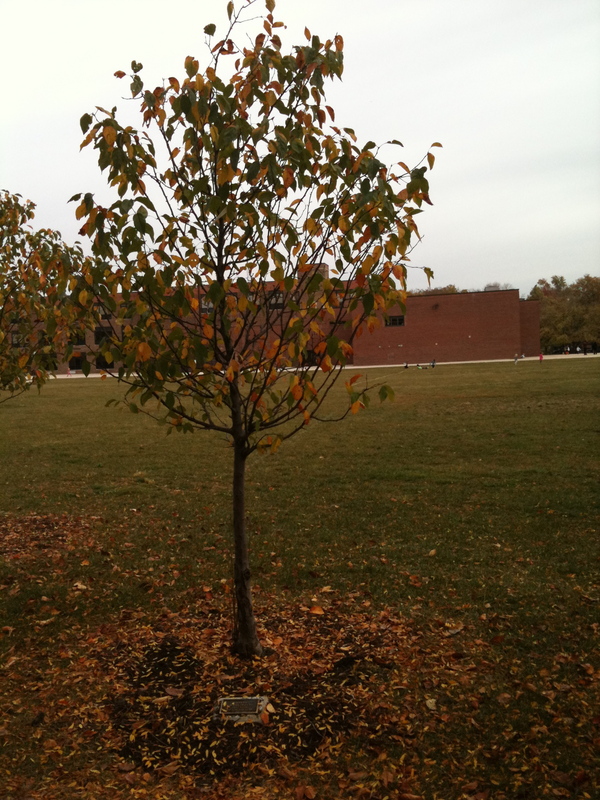 May God’s Love continue to bless you on your journey..
Jordan’s tree what a beautiful symbol of a life well lived…..